Southwest Bolivia’s Salar de Uyuni is not only the world’s largest salt flat - it's also the largest mirror on the planet! The incredible 6,575 square mile flat is home to many shallow lakes that reflect the gorgeous skies, clouds and animals of Bolivia. A walk across the miles of white salt looks more like a trek across the moon than a trip through South America. Prehistoric lakes once covered Bolivia’s Salar de Uyuni near the crest of the Andes. When these lakes dried up over hundreds of thousands of years, their rich salt content was left behind, and it became the thick salt crust that coats the region today. The shallow pools of brine are also rich in lithium – they contain 50 to 70 percent of the earth’s reserves. During the rainy season, most of the enormous salt flat is covered by shallow water, as rain has nowhere to drain. These few inches of water have a dazzling effect on the landscape, transforming the plane into one endless mirror that reflects the sun, sky, clouds, visitors and the indigenous pink flamingos that heavily populate the area. The region is 11,995 feet above sea level, making it an optimal spot to monitor and calibrate satellites. The incredible clouds often break to clear skies, with blue and white reflected below. Salar de Uyuni sees a lot of traffic ranging from from tourists to companies coming to mine the layers of salt, potassium, lithium and magnesium from the surface. It is also a major car transport route during the dry seasons. 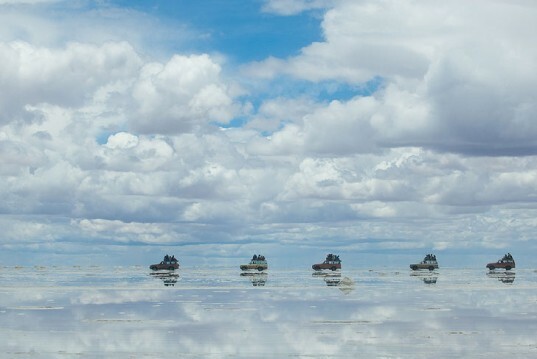 Salar de Uyuni is a beautiful natural mirror, but also an important source from salt and lithium, which is a vital component in electric batteries. definetly! want to go with me? Will I be able to experience the "mirror" if I go in early July, the winter season? Or is it almost 0% chance of rain and sheet of water on the surface? Prehistoric lakes once covered the region near the crest of the Andes. When these lakes dried up over hundreds of thousands of years, their rich salt content was left behind, and thus became the thick salt crust of today. The shallow pools of brine are also rich in lithium, containing 50 to 70 percent of the earth’s sources. During the rainy season, most of the enormous salt flat is covered by shallow water, as rain has nowhere to drain to. These few inches of water have a dazzling effect on the landscape, transforming the plane into one endless mirror, reflecting sun, sky, clouds, visitors and the indigenous pink flamingos that heavily populate the area. The region 11,995 feet above sea level, making it an optimal spot to monitor and calibrate satellites. The incredible clouds often break to clear skies, with blue and white reflected below. Salar de Uyuni sees a lot of traffic, from tourists to industry coming to mine the layers of salt, potassium, lithium and magnesium from the surface. It is also a major car transport route during dry seasons. 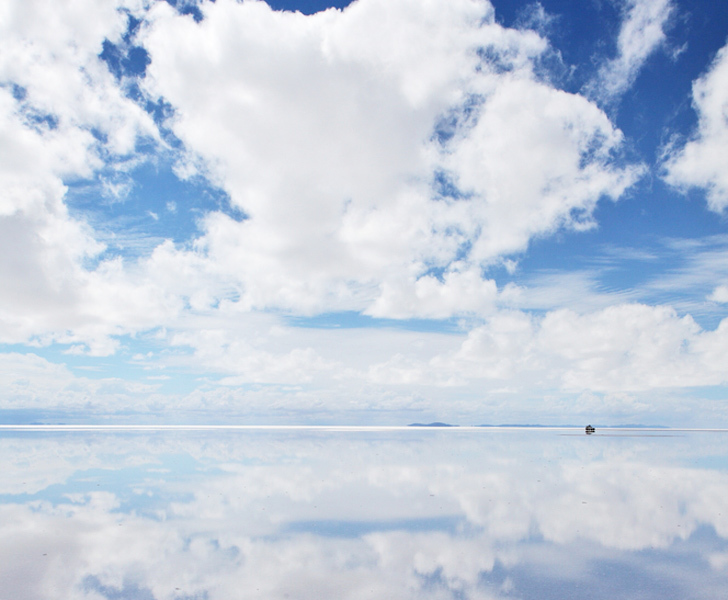 Salar de Uyuni is a beautiful natural mirror, but also an important source from salt and lithium, a vital component in electric batteries.